Welcome to West Virginia’s “Best Of The Outdoors” for Summertime Fun right here in the heart of the Spruce Knob Seneca Rocks National Recreation Area near Seneca Rocks. We know that you will love this WV Landmark Destination. 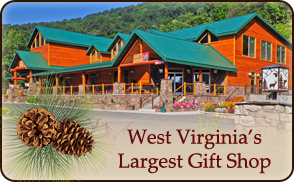 Inside the Smoke Hole Gift Shop, “West Virginia’s Largest”, there is something for everyone including bus tours, school groups, and families to enjoy. 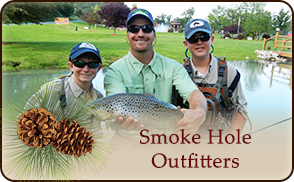 The Gift Shop features an award winning Wildlife Gallery, with specimens from as far away as the Aleutian Islands, New Zealand, Canada, New Mexico and others brought in by our very own, Smoke Hole Outfitters/Cabela’s Pro Staff Members, Josh and Rachelle. 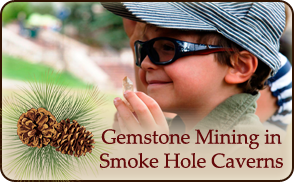 The new outdoor “Gemstone Mining,” will keep the young’uns and the adults occupied hunting for fossils and gemstones, while others enjoy a fun & unique shopping experience or tour the caverns. Scenic Smoke Hole Motorcycle Tours are one of our region’s most popular tourist adventures and begin here at Smoke Hole Resort. Bikers from all over the United States come to the Potomac Highlands to feel the rush of mountain roads that rise and fall leading to fabulous mountain streams and historic sites, all rich with the history of Appalachia…So join us for blue skies, open roads and mountain vistas, COME AND “RIDE THE HIGH FIVE” COUNTIES OF WEST VIRGINIA.